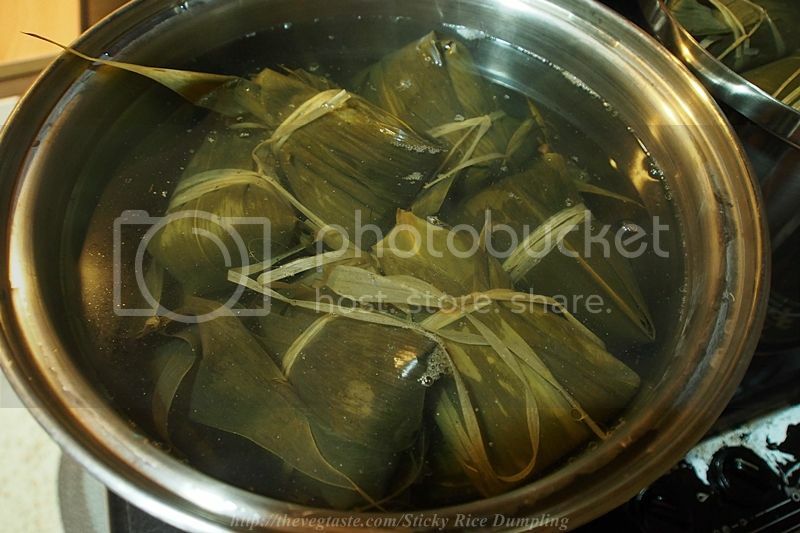 Sticky rice dumpling 粽子 is a popular treat during Dragon Boat Festival which falls on the fifth day of the fifth month of the Chinese lunar calendar. The dumpling filled with sticky rice and all kind of goodness or just simply sticky rice made with alkaline water, and eaten with a sweet sauce. There are several legends surrounding the origin of the dragon boat festival, which is also called the “Festival of the Double Fifth.” The most popular one is the story of royal throne-fighting war history on the death of China’s famous poet name Qu Yuan who was committed suicide by grasping a large rock and throwing himself into the Miluo River on the fifth day of fifth lunar month. Well, whatever legend or story behind it, let’s savor! Here is simple recipe and fewer ingredients for beginner like me. Hope you enjoy! 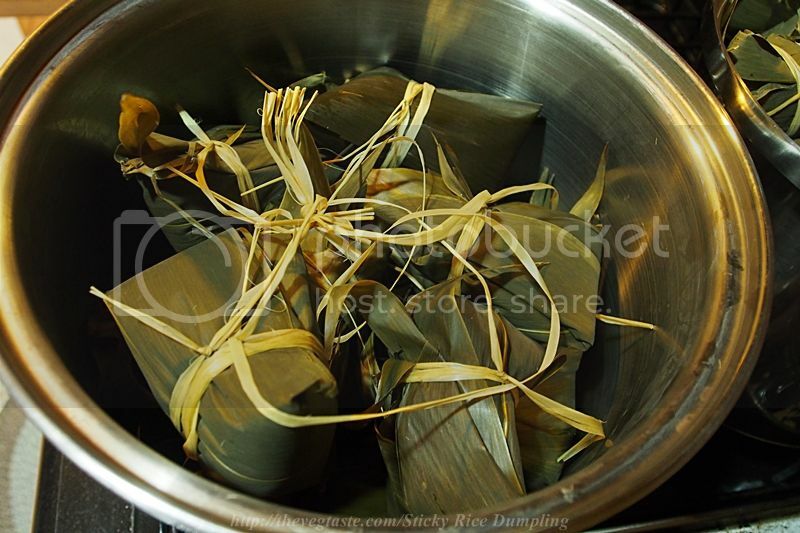 The process making sticky rice dumpling could be a challenging task but if you plan properly and spreading the job into different day that will make your life easier and you will enjoy the whole process. 3) Cover all the ingredients properly. 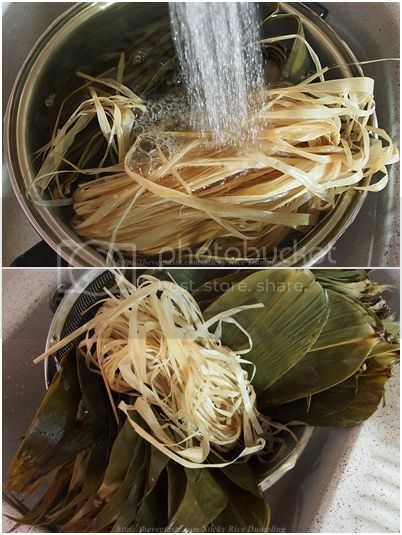 4) Clean the dumpling leave and grass strands. 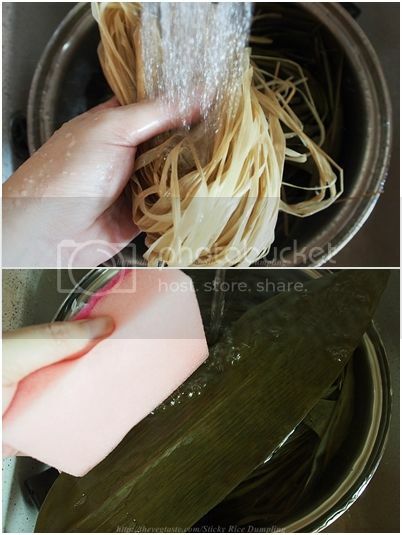 Use a cloths or sponge to clean every piece of dumpling leaves under running tab water. This was the most time consuming step, will take an hour from start to finish. Relax! 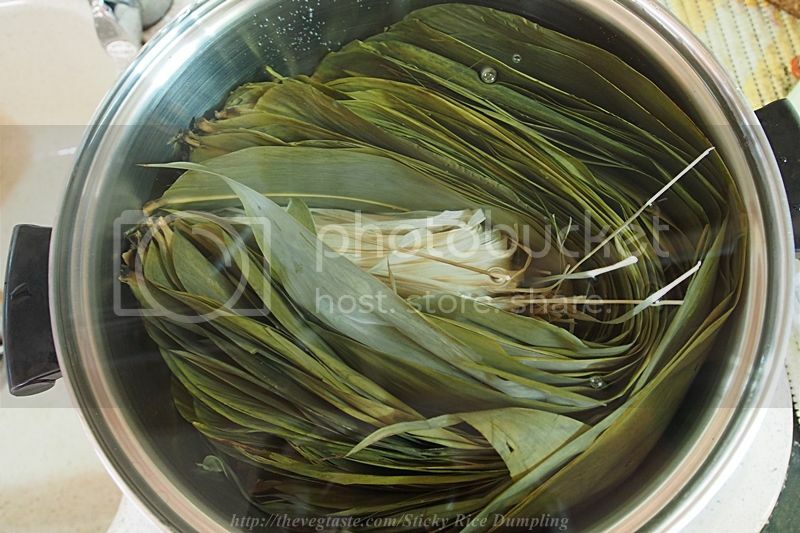 5) Return the dumpling leave and grass strands into the pot and top with clean water. Bring to boil for 1 hour on slow fire. The water need to cover up the leave. 6) You may go to have a heavy breakfast at this time. You need a lot of energy and expected no time for your lunch. 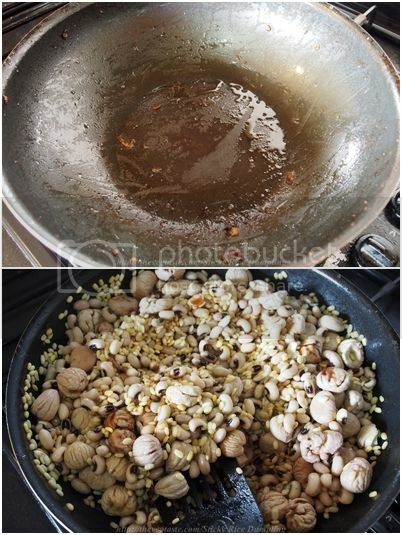 7) After an hour of boiling, change the water and top with clean water. Bring to boil again for 10mins. Now, turn off the heat and cover completely with lid. Allow to sit until cold. 8) By now, defrost the vegetarian lean meat. Set aside. I’m using vegetarian lean meat as the following image, you may use any kind of vegetarian products at your own preference. 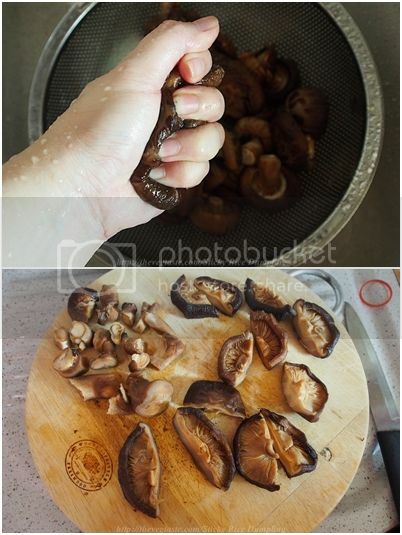 10) Gently squeeze to expel excess water from the shitake mushroom and cut into half. 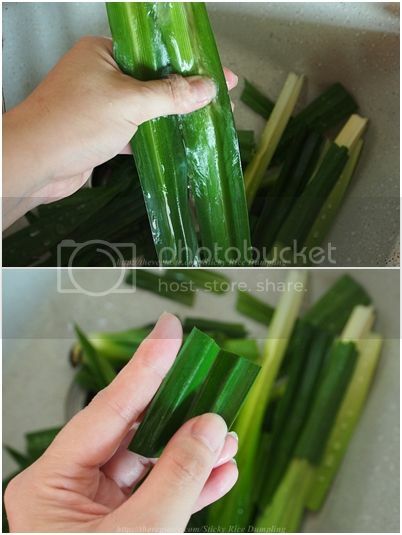 11) Clean the pandan leave thoroughly and cut into half figure long. Mixed well and set aside. All amounts are approximate. Please taste as you go along, and adjust as necessary! Adding more sauces if too plain for your taste. 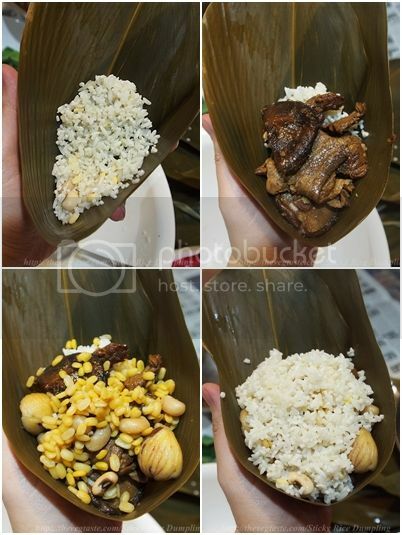 The taste should be more salty than normal course because all the saltiness will be tempered later by the plain-tasting rice and beans surrounding it. 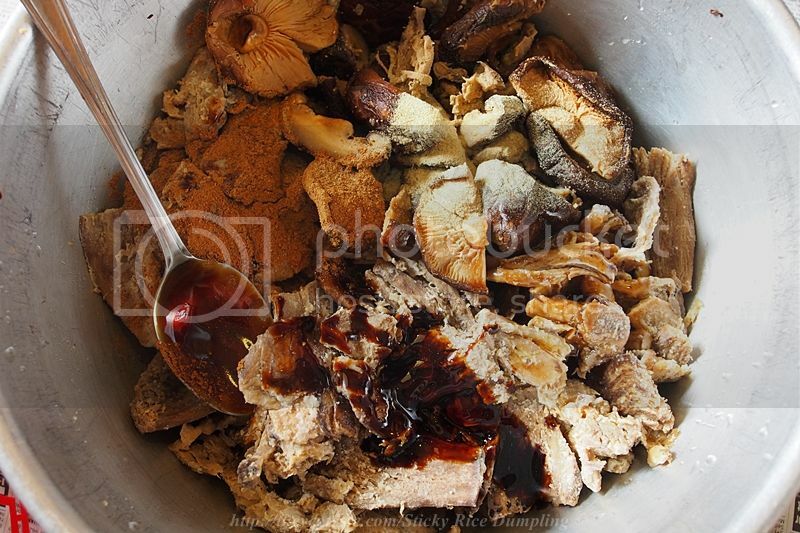 13) While our ingredients on marinating. Let’s have a final clean on the dumpling leave. Rinse the dumpling leave and grass strains under running tab water and drain. Set aside. 14) By the now the ingredients should be get marinade. 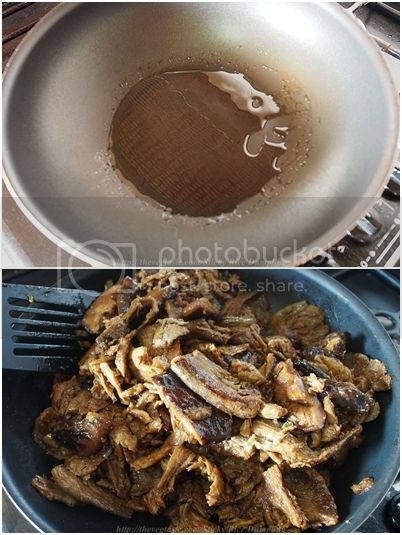 Place a wok or large frying pan over medium-high heat with 3tbsp. of cooking oil. Add marinade vegetarian lean meat, stir-fry until fragrant. Turn off the heat and set aside to cool. 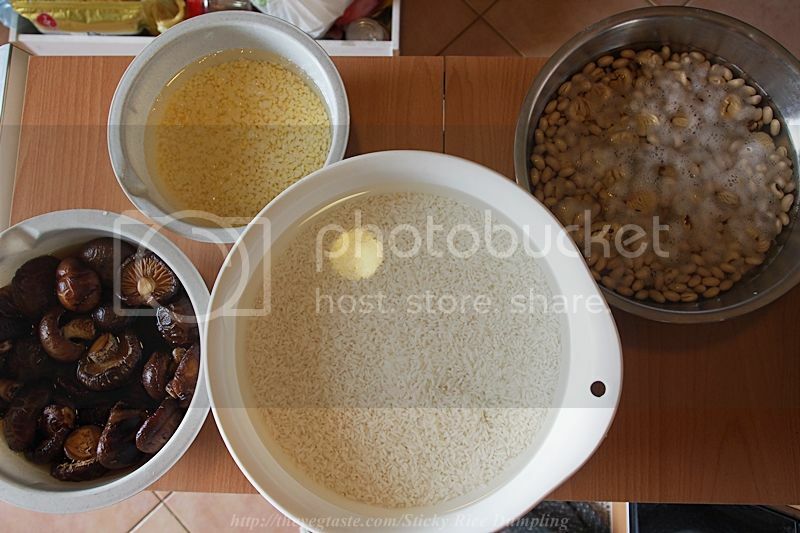 16) Place all beans in the pot that we use to marinade the vegetarian meat just now, let it absorbed the left over sauces. Using the same wok, stir-fry the beans for 5mins. Set aside. 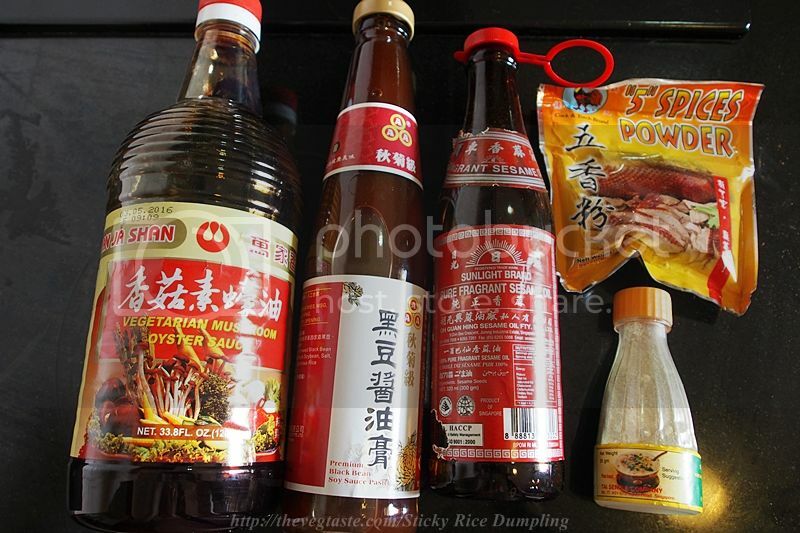 17) All ingredients are ready. 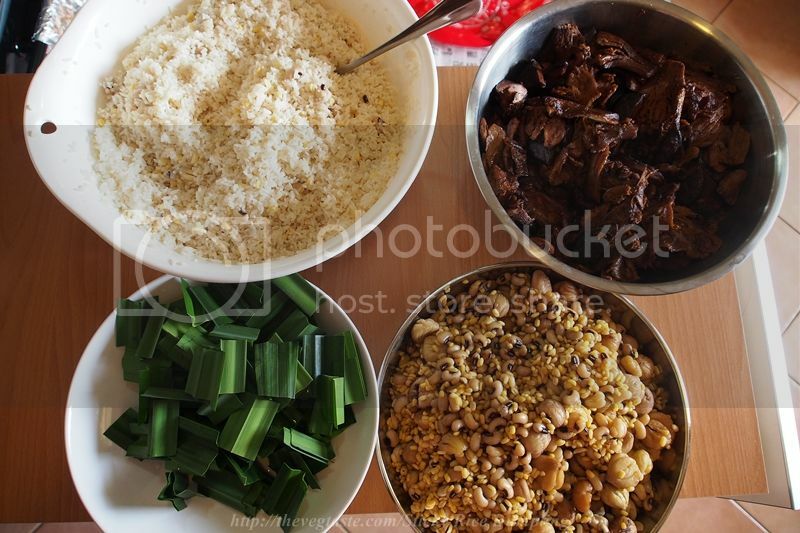 Clock wise: Glutinous rice, vegetarian lean meat, all kind of beans and pandan leaves. Set up your wrapping station nicely. 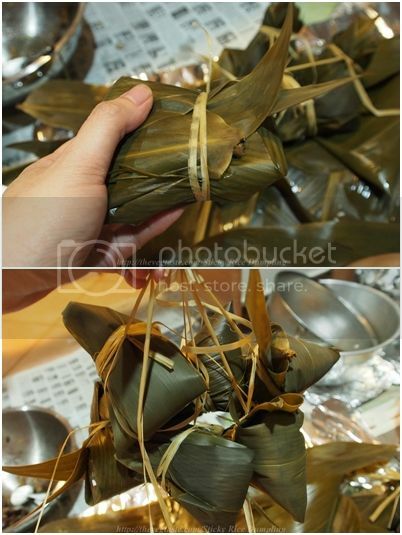 Take 1 piece of dumpling leaves, fold from the middle and twist both ends to form a pouch. 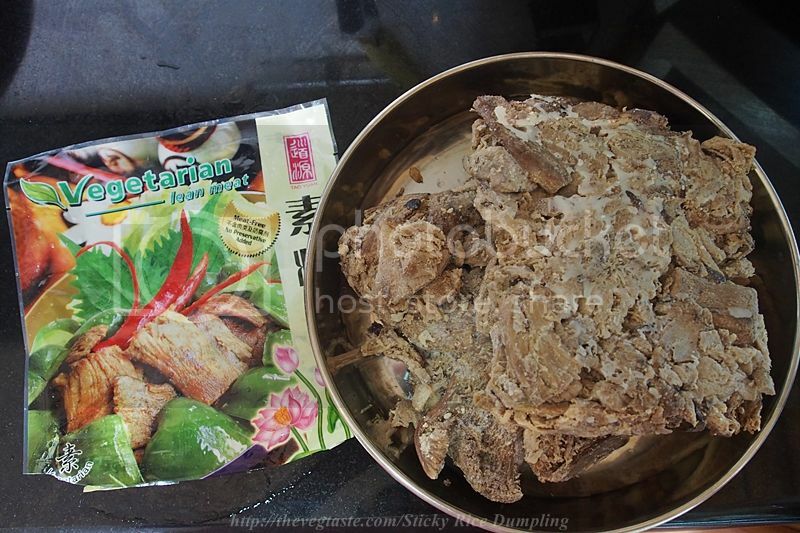 Do not use any leaves which already have holes as they will cause water to seep into the dumpling during the cooking process or broken leaves as this will make hard time during wrapping. Scoop 1 ½ tbsp. 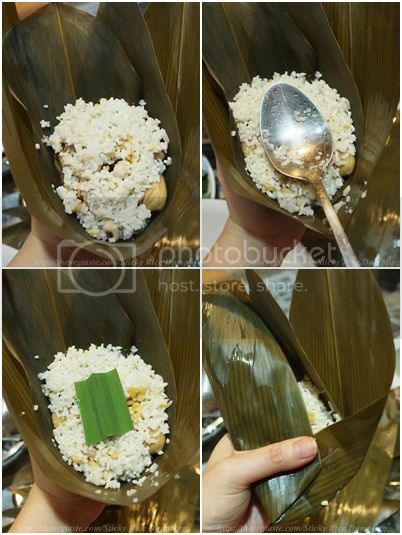 of glutinous rice, fill the pouch. 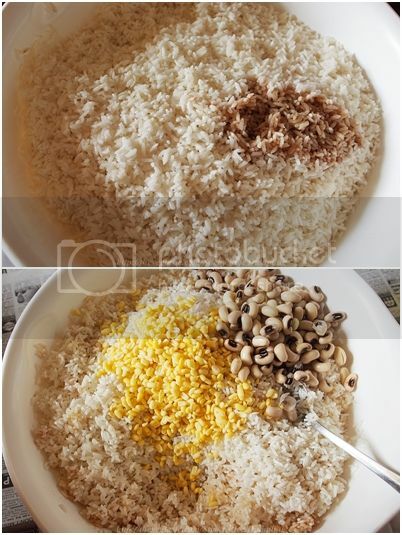 Gently spread the rice by making a well in the center of the pouch. Now place 1 tbsp. 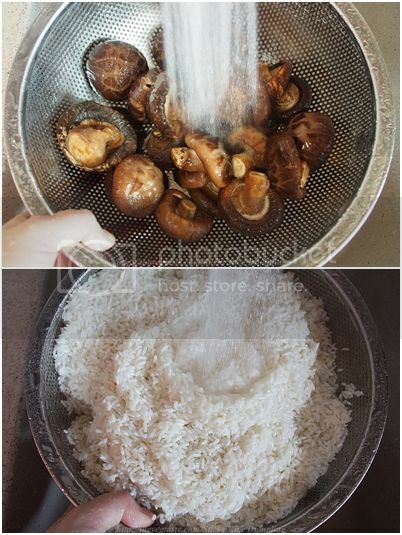 vegetarian lean meat over the rice, follow by 2pcs of the half pcs mushroom and 1 tbsp. of beans. Now take another 2tbsps. 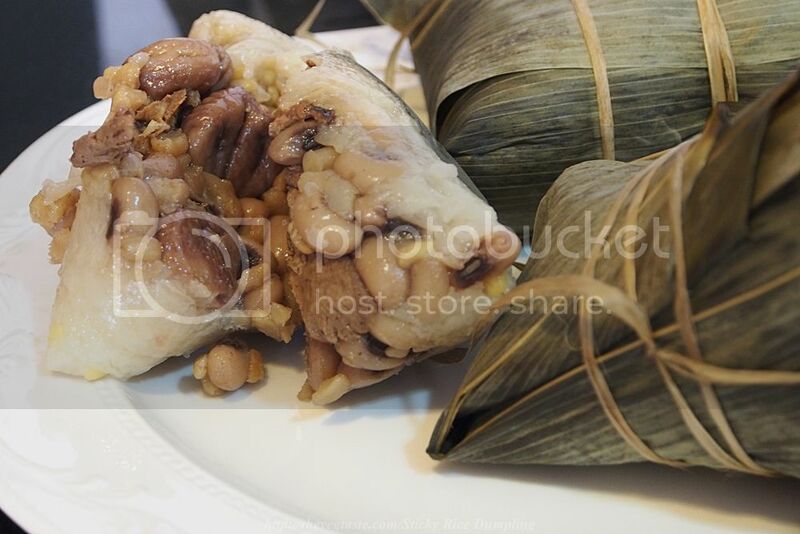 of sticky rice and cover the filling. Use a spoon; gently pat tight all the ingredients. Place 1 piece pandan leaf on top. 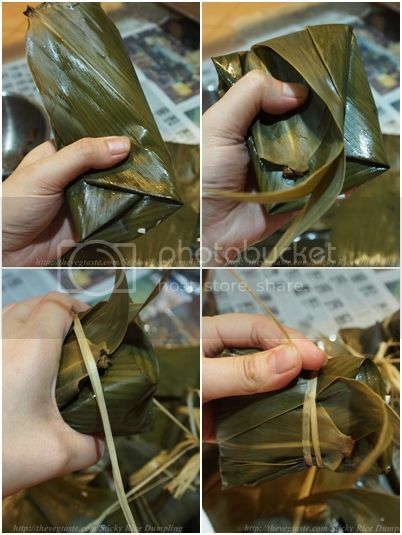 Take another dumpling leave, cover the side of the filled leaf, hold the pouch tight and fold the leaves around the pouch. Think of wrapping present or parcel. 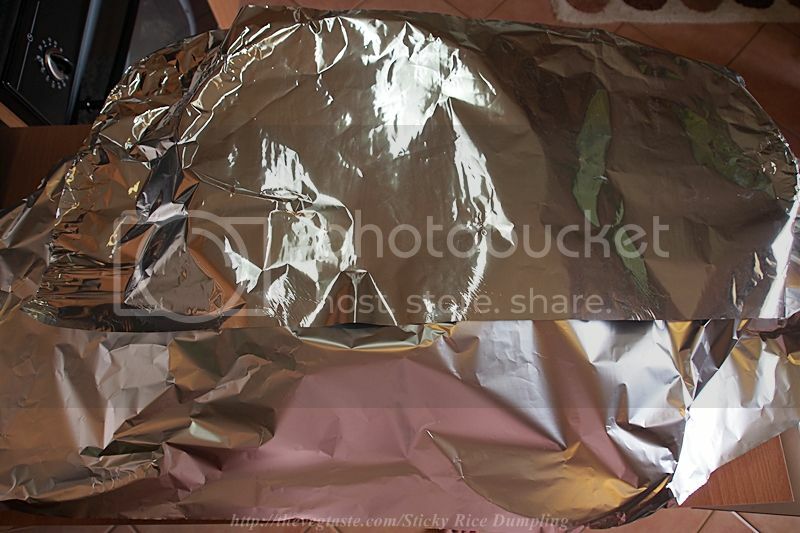 Secure by tying it with grass strands; make sure the dumpling is securely wrapped. Repeat steps till all ingredients used up. 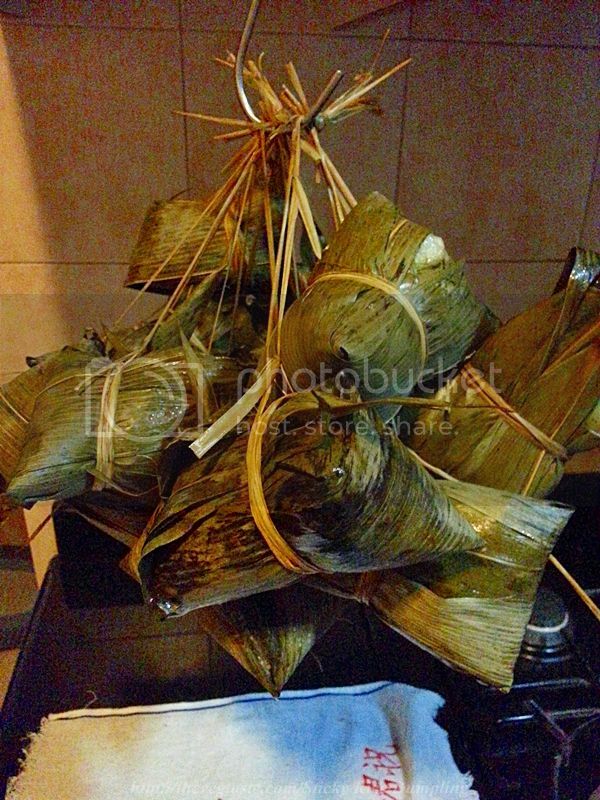 Sticky Rice Dumpling can be in many shapes, but the most common shape is pyramidal or triangular. The wrapping skill takes years to perfect. You may use the shapes or methods that you most comfortable with. 19) Arrange the dumpling in the big pot. 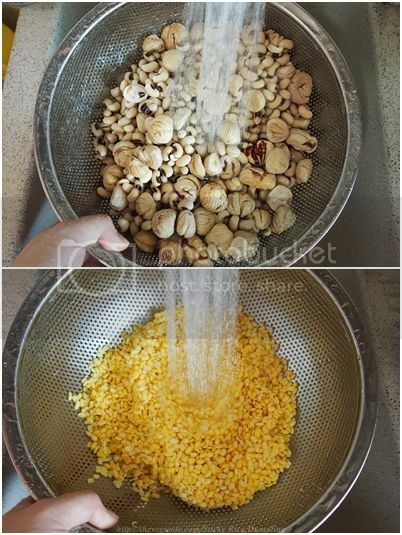 20) Pour in hot water, the water should be cover up all the dumplings. Cover the pot with a lid. When the water comes to a bubbling boil, reduce heat to low, simmer for 2 hours. 21) After 2 hours. Hang the dumplings to cool or serve hot. 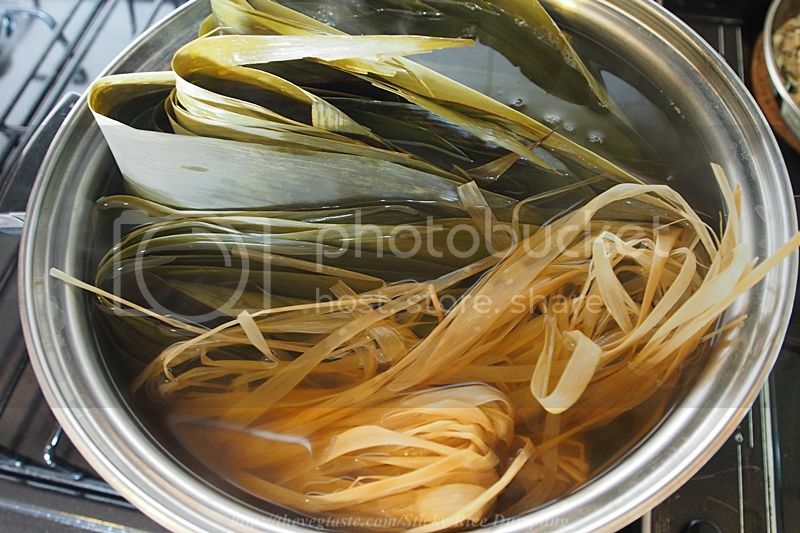 Eat the dumplings out of the bamboo leaves; the leaf lends the dumpling a unique fragrance and flavour. Store the sticky rice dumplings in the refrigerator for a week or put in the container or plastic wrap and freeze for few months long. Then simply thaw and heat up by either steaming or microwave them for easy meal or snack.